GraphQL is a powerful new tool for building APIs that allows clients (typically web and mobile apps) to ask for only the data they need. Originally designed at Facebook to minimize data sent over the wire and reduce the number of roundtrip API requests for rendering views in native mobile apps, GraphQL has since been open sourced to a healthy community that is building developer-friendly tools. GraphQL has quickly been adopted by several notable companies, including Github, Yelp, Coursera, and Shopify, replacing existing REST APIs. The goal of this Refcard is to introduce you to the concepts of GraphQL, from writing GraphQL queries to building a GraphQL server. 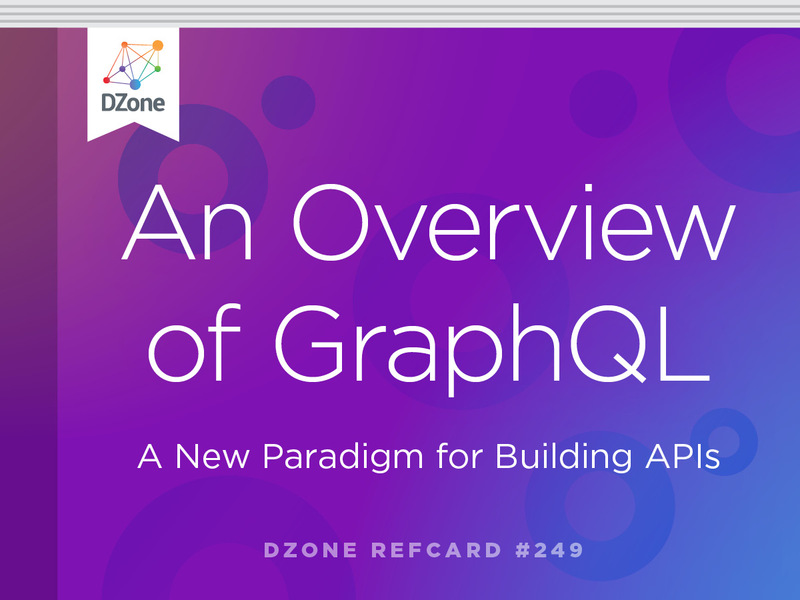 Despite what the name seems to imply, GraphQL is not per se a query language for graph databases — it is instead a query language and runtime for building APIs. The “graph” component of the name comes from the data model that GraphQL uses to work with application domain data, making the observation that your application data is a graph. Connected entities is the natural way that we intuitively think of our data, and GraphQL allows us to express our data in the same way we think about it, as a graph. GraphQL itself is simply a specification, and there are many great tools and libraries available for building GraphQL APIs in almost every language, as well as clients to simplify the process of efficiently querying GraphQL services. The graphql-js reference implementation is the standard GraphQL service implementation. Schema/type system. GraphQL requires a user-defined schema built using a strict type system. This schema acts as a blueprint for the data handled by the API, allowing developers to know exactly what kind of data is available and in what format. Developer tools can take advantage of the schema through the use of introspection, enabling documentation, query auto-complete and mocking tools. Request only data needed. Since GraphQL queries can define what data exactly is needed at query time, all the data required to render an application view can be requested in a single request, reducing the number of roundtrip network requests and with that, the application latency. Wrapping existing data services. GraphQL can work with any database or data layer, allowing for a single GraphQL service to fetch data from multiple sources in a single request served by the composed API. Note: All code referenced in this Refcard is available online as an Apollo Launchpad, an interactive playground for building and querying GraphQL APIs, here. Here we define a Movie type, the fields that exist for Movie, and a query, moviesByTitle, that takes two arguments: title and limit, both of which are required (indicated by the exclamation point). The moviesByTitle query returns an array of Movie objects. By specifying the fields we want returned, this query is traversing our application data graph to find the data requested. Note that we haven't covered how to actually fetch this data from our data layer — that logic is implemented in our GraphQL service's resolver functions that handle the individual fields of our query. We'll see how to build resolvers in the next section, but first let's look at GraphQL schemas and the type system in more detail. Building a GraphQL service requires a schema to be defined that describes the types, fields, and queries available for the service. This schema will define the types and GraphQL queries that we'll be able to use in our API. You can think of the schema as the underlying API blueprint or specification. GraphQL services can be implemented in any language, so we need a language-agnostic way to define our GraphQL schema. We use the GraphQL schema language (also called the GraphQL Interface Description Language or IDL) to define our schema and types. Object types An object type that can be fetched, including what fields it provides. For example, Movie is an object type, with fields title, year, genres, and plot. [Movie] indicates an array of Movie objects. ! indicates a required field. Scalar types Common primitive types. By default Int, Float, String, Boolean, ID (serialized as a string but not necessarily to be human readable). 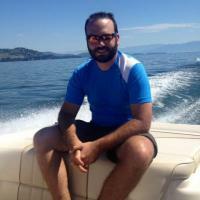 Query types An entry point into a GraphQL service. The Query type defines the queries available for the GraphQL service. Mutation types Also an entry point into the GraphQL service, mutations are update operations. Enumeration types A type of scalar restricted to a set of pre-defined values. Interface types Abstract type that includes a set of fields that must be implemented by another type. Interface types are used when returning an object that can be one of several types. Union types Similar to interface types, however Union types don't specify common fields. Input types Used to pass complex objects to a mutation or query. Queries and mutations are the entry point to the GraphQL service. Each type is composed of one or more fields, which can be scalar values or complex objects that refer to other types, resulting in nesting. All GraphQL queries must at least specify fields to be returned. This is referred to as the selection set. Optionally, we can include the operation type and operation name in our query, in addition to our selection set. This blog post contains a good overview of GraphQL terminology, including terms like selection set, operation, and operation name. While queries allow us to request data, GraphQL mutations are used for updating data and provide an additional entry-point into our GraphQL API. To use mutations, we include a Mutation type in our schema, which defines the mutations allowed in our GraphQL service. One way to think of mutations is as user-defined commands where the logic is defined in the GraphQL server implementation. "title": "Night and the City"
In the previous mutation example, we passed three individual arguments of primitives to define the update we wanted to make. We can instead use an input type to pass a more complex object as a variable. Input types are especially useful for mutations where we want to pass our update as a single object. PersonResult can be either a User or Actor. In this case, we'll need to use an inline fragment to ensure the result of our query is resolved to the correct type. GraphQL, by design, can work with any database (relational or NoSQL) or backend system, but in this example, we'll be using the Neo4j graph database as our persistence layer. Why use a graph database with GraphQL? The idea of application data as a graph is an underpinning design choice of GraphQL. GraphQL enables developers to translate their backend data into the application data graph on the frontend, but if we use a graph database on the backend, we can do away with this impedance mismatch and have graphs all the way down. First of all, we’ll need a Neo4j database (with data) for our GraphQL server to query. For this example, we’ll make use of a Neo4j Sandbox instance. Neo4j Sandbox allows us to quickly spin up a hosted Neo4j instance, optionally with existing datasets focused around specific use cases. We’ll use the Recommendations Neo4j Sandbox, which includes data about movies and movie reviews and is designed to generate personalized recommendations (for example, by using collaborative filtering to recommend movies based on similar users’ reviews). The graph database model that our GraphQL service will be querying. We’ll follow the “GraphQL First” development paradigm. In this approach, we start by defining a GraphQL schema. This schema defines the types and queries available in our API and then becomes the specification for the API. If we were building a complete application, the frontend developers could use this schema to build out the UI while the backend team builds the GraphQL server implementation in parallel, speeding up development. Once we’ve defined our schema, we’ll need to create resolver functions that are responsible for fetching our data, in this case from Neo4j. Note: This schema omits a few examples; see the full code here. // for users who review this movie, what other movies do they review? Note that we've omitted several resolver functions required by our schema. The full code example is available as an Apollo Launchpad here. Now that we've defined the GraphQL schema and resolver functions, we are ready to serve the GraphQL endpoint. While the GraphQL specification does not specify a client-server protocol for GraphQL, HTTP is the most common choice. A GraphQL server handles a single endpoint, usually /graphql, and all requests for the service are directed to this single endpoint. A GraphQL HTTP server should handle both GET and POST requests. Most of the common GraphQL server libraries, such as graphql-express (a common library for serving a GraphQL endpoint using the Express Node.js webserver), provide this behavior. As most GraphQL services use HTTP as the client-server protocol, we can use any tools capable of sending an HTTP request to query a GraphQL endpoint. However, there are developer tools designed specifically for working with GraphQL endpoints that offer advantages. One of the easiest ways to query a GraphQL endpoint is to use GraphiQL. GraphiQL is an in-browser IDE for GraphQL that allows for viewing a GraphQL schema through introspection, defining variables, and autocompletion and validation for GraphQL queries. Tools such as graphql-express include options for serving GraphiQL alongside the GraphQL endpoint. The GraphQL specification includes a feature called a directive, which can be attached to any field or type (either in the schema or in a GraphQL query). The core GraphQL specification includes only two directives: @include(if: Boolean) and @skip(if: Boolean). However, directives provide a mechanism for extending a GraphQL implementation while remaining fully compliant with the GraphQL specification. You can learn more about using subscriptions with Apollo Client here. The full code example used in this Refcard is available as an Apollo Launchpad here.